Saving changes not permitted MSSQL 2008 | It is what it is, sometimes it helps. We recently upgraded a few SQL server boxes to MS SQL Server 2008. I also installed the new Enterprise Admin tools and after working on a new project I hit a slight brick wall. This kept coming up when I tried to change column attributes and re-arrange column orders for a table that existed. It was odd I could make schema changes like this with SQL 2005 why not 2008? Turns out its a simple setting that's on by default in the SQL 2008 Enterprise manager ( Express and Full ) and João Fernandes gave me the solution over twitter only a few mintues after I asked. 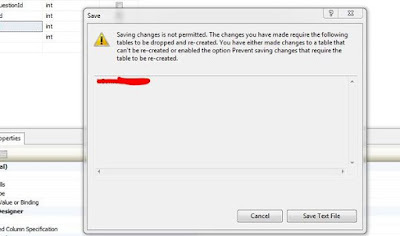 Click "Tools" , Select "Options", Expand "Designers", select "Table and Database Designers" then deselect "Prevent saving changes that require table re-creation"
I agree. Our DB upgrades are scripted but in development we use the Visual tools. I didn't know it was officially a bug I can imagine alot of people have been frustrated with this issue.